Juniper Research today published new data outlining predictions for mobile payments processing over the next five years, placing Apple Pay at the forefront in the market ahead of rivals like Samsung and Google. The study looked at Apple Pay, Samsung Pay, Google Pay, and other "OEM Pay" (official equipment manufacturer) wallets. In total, OEM Pay users will reach 450 million globally by 2020, and the researchers predict that Apple Pay will account for 1 in 2 of these OEM Pay users at that time. This growth will cause OEM Pay wallets to reach $300 billion in transactions by 2020, representing 15 percent of total contactless in-store transactions within two years. While Juniper Research included newcomers to the mobile payments market like Fitbit Pay and Huawei Pay, they admit that these will likely not grow much and mobile wallets will continue to see leaders in Apple, Samsung, and Google. Although mobile wallets will continue to grow, the research shared today also looked at the overall market of contactless payments, which will still see dominance from contactless card payments made using physical credit and debit cards. In-store contactless payments will reach $2 trillion by 2020, making up 15 percent of the total point of sale transactions and driven by "strong adoption" in Europe and countries in the Asia Pacific region. Sooner than 2020, contactless payments are already set to exceed the $1 trillion mark for the first time in 2018, one year earlier than Juniper Research previously predicted. These NFC-enabled credit cards began growing in popularity in recent years, arriving at a time when major credit card companies are aiming to simplify the checkout process for customers using both physical and digital cards. In another Apple Pay-related research note shared earlier this year, Loup Ventures estimated that Apple Pay was being used on 16 percent of active iPhones worldwide. Looking to the future, Loup Ventures also predicted that Apple's mobile wallet will "gain widespread adoption" over the next three to five years, despite a slow few years of growth that began when Apple Pay launched in 2014. I was extremely skeptical of Apple Pay when it first came out. I'm in the UK with contactless so I thought it was mainly to benefit US consumers where they had to sign cheques and do all these antiquated payment methods we'd got rid of decades ago. It's essentially the same process, I told myself - get out your card and put it on the reader. Get out your phone and put it on the reader. What's the difference? Well one iPhone X 9 months later and I don't carry my wallet with me any more. There's something really great and secure about Apple Pay. It's nice to have everything in one place with digital receipts when you make payments. Also there's no payment limit like there are with debit cards, unless you decide to shop at Tesco and they have a 30 pound limit on all contactless payments. Yeah, I'm definitely not surprised at this news. In fact I could definitely see it being much higher than 50% in a couple of years. Apple Pay slays. I just wish more big US chains like Home Despot would start supporting contactless payments. Couldn't manage without Apple Pay nowadays. Many times I forgot my wallet at home and Apple Pay came to the rescue. Funny how many cashiers still say "That's cool!" when I use my Apple Watch to pay. A real game changer! I used Apple Pay once on a vending machine and they charged me a 50 cent fee for using it. I never used Apple Pay again after that. So that ‘50 cent vending machine fee’ swayed you from ever Considering Apple Pay again? 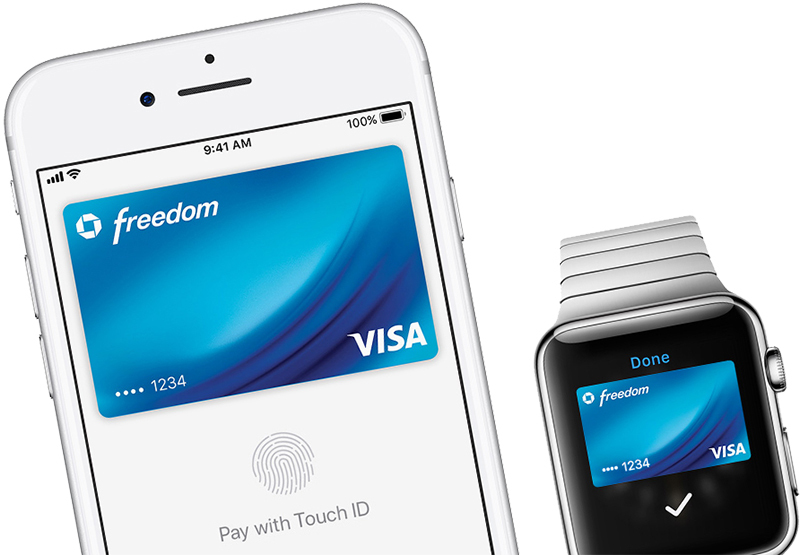 Seems like you’re looking for a reason to dismiss Apple Pay altogether. Apple Pay. I'd rather avoid fees as much as possible for anything. How did the vending machine know you were using Apple Pay? Correct me if I’m wrong but... as far as the contactless reader is concerned, Apple Pay appears to be just another contactless card. Most readers can’t distinguish between a contactless card or a mobile with nfc. Which is even worse because Apple Watch has shorter battery life and worse reception than phones or it happens to separate. Compared to plastic card use that's unaffected by battery life or reception and is significantly more durable. I can live without my phone for communication but not without the ability to buy gas, food or get emergency cash. Critical things are better left simple and reliable. Why do you keep mentioning reception? You don’t need any reception to use Apple Pay, it will work with the device in airplane mode. Same here. And it is even better on the Apple watch. Being able to have nothing in your pockets, not even the phone and still be able to purchase stuff is great. And luckily for us, contactless terminals are everywhere here in UK. More accurate title would be half of establishments don't or won't take Apple Pay. Also, never understood why people risk dropping a $1K phone and the added trial and error inconvenience just to make a payment with phone when it can be done simply and fool proof with plastic. Plus, Amazon Prime Whole Foods hassle free method without check-out process makes Apple Pay obsolete. Shopping will be as convenient as walking into your kitchen and walking out with food/drinks. There is no trial and error. I simply double press the home button on my Apple Watch, pay, and go. Works every time. I can even go running with just my watch and not bring my wallet with me and still be able to buy dinner from subway afterwards. Faster than fishing for a card out of my wallet (and still having to put it away). I've gone back and forth between Apple Pay and Samsung Pay. My biggest issue is not really with either of them, but the lack of acceptance for contactless payments. It's pathetic. Currently using Samsung Pay on my Note 8 as it has MST to work on the swipe/chip only terminals. Still love the look on peoples faces when I hold my phone to the terminal and it works. It always starts with "we don't accept phone payments". We don’t use MST in the Uk so Samsung pay has no advantage over Apple Pay. Apple Pay, Android pay and Samsung pay can all be used at the same places, those that accept contactless payments. It came to the UK first. Apple was in the UK for at least a year before android pay came. Samsung pay came about another year after that. My bank supports all three but in the UK Apple Pay is supported by the majority of banks. Android and Samsung pay aren’t supported by that many banks. Apple Pay worked on the Apple Watch from day one. It took a few years before it became available on Samsung watches and is only available on a limited number of wear watches. I use Apple Pay exclusively on my Apple Watch in shops. I also don’t carry an android phone all year round. Only usually have one for a few months a year. My iPhone is my daily driver. That's what happens when mindless bots/Apple employees/fanboyism take over common sense. It's also potentially dangerous to frequently flash a $1K phone as you could end up as a crime statistics. So, on top of Apple Pay not working in a lot of places you should also avoid using it in questionable areas like gas stations, small stores, public stalls, bad neighborhoods, etc. Too much of a hassle and headache vs plastic that works 100% everywhere, has zero value to criminals and is freely replaceable. I don’t ever have to get my phone out to use Apple Pay or get anything out. I use my Apple Watch which is on my wrist. My phone stays in my bag. Was that just because it was apple pay or because it was a credit/debit transaction? That's the equivalent of saying - there was an accident on this road yesterday so I'm never going that way again. I find apple pay easy and convenient, not a necessity but an amenity where I don't have to pull out my wallet or CC when needed.